Sometimes it’s the small things that make a big difference between a good looking car, and a great looking one. Your paint can look fantastic, but if you haven’t taken the time to properly detail areas such as the wheels, wheel wells, glass, or the exhaust tips, then the job simply isn’t complete. Perhaps the most frequently overlooked area is the exhaust tips. Although it can be a bit of a messy job if they’re neglected, it’s actually quite simple and doesn’t require a tremendous amount of time to do it right. Not only does it make the car look much better when the exhaust tips are detailed, but it also prolongs the life of the finish, which is usually stainless steel or chrome. Similar to wheel care, if neglected the finish on your exhaust tips will start to corrode, pit, or discolor. With regular maintenance however, they will stay looking nice for a very long time. First let’s take a look at the exhaust tips on this 2005 BMW M3. As you can see, they’re in need of some serious work! Upon my initial inspection, I could tell that they were showing signs of pitting on the outside, and permanent etching on the inside towards the end of the tips. I’ll work on the wheels and exhaust tips first before washing the car so that I don’t get any residue/overspray from them onto a freshly cleaned painted surface. I’ve got my buckets ready and supplies staged, so let’s get busy! Once again, here are the exhaust tips before I got started. First I start by spraying down the inside and outside of the tips with Chemical Guys Grime Reaper APC at a 5:1 ratio. It’s shipped as a concentrate, so you’ll want to get a DI Trigger Spray Bottle to mix your solution in. After letting the APC dwell for a minute to start breaking down the grime, I’ll clean the outside part of the exhaust using either a Mini E-Z Detail brush (they are perfect for cleaning the areas between a dual-tip setup like this one), or an old microfiber towel that I strictly use for dirty jobs. Now it’s time to use some 0000 steel wool (very fine grade) with the CG Grime Reaper to clean out the insides of the exhaust tips. Take a look at the dramatic difference between the two sides…and this is even before polishing! After I cleaned all 4 tips in the same manner, I washed and dried the M3 (and polished it), and am now putting all of the finishing touches on the car. Your exhaust tips are now clean, but if you want to take them to the next level, I recommend polishing them up a bit both inside and out. Here I am using Optimum Metal Polish and 0000 steel wool on the insides of the tips. Now I’m moving on to the outside of the tips once again with Optimum Metal Polish and an older microfiber towel that I no longer use for the painted surfaces. If there’s a grain in the finish, then be sure to polish with the grain. Another product that I like to use on the outside of exhaust tips is Klasse All-In-One. All finished! As you can see, the insides of the exhaust tips have a bit of permanent etching from infrequent cleaning, but they look much better, and will remain that way with simple cleaning during each wash. The M3 looks great, and the bright exhaust tips add a professional finishing touch! I was reading your post and when I was reading Chemical Guys Grime Reaper APC at a 5:1 ratio. What do you mean 5:1 ration? I got lost right there. That means 5 equal parts water, 1 equal part Grime Reaper. So for each 6 ounces that you mix (for example), 5 ounces will be water and 1 ounce will be Grime Reaper. Do you only use 0000 steel wool to clean the inside and not the outside? It depends on the finish and the condition. If it’s a bright chrome on the outside, I will only use the metal polish and a soft cloth. If it’s a stainless steel or bare metal finish and is in bad shape, then I’ll use the 0000 steel wool on it. Thanks for the clear how-to. I wondered if it’s safe to use the Grime Reaper on upwards facing exhausts like motorcycle ones? Or would you advise to take off the exhaust pipe? I found a second-hand Yoshimura that needs cleaning but wouldn’t want to cause any harm to it. You can use a similar technique, but just don’t put as much cleaner or water on the area. I’d first start out by placing a shop rag or some paper towels in the end of the muffler so you don’t get the packing wet (fiberglass stuff inside the muffler that keeps it quiet). Then I would spray your APC onto a Scotch Brite pad (not directly into the exhaust tip), and clean it that way. Just be careful of the finish. On the brushed aluminum or stainless steel models, they clean up very easily, and a Scotch Brite is good to work with the grain of the surface. If it’s a polished or Ti tip however, you want to be much more gentle with it and only use a soft cloth. Todd, do you think OPT Power Clean or P21S TAW are viable options instead of the CG Grime Reaper? If so, which of the 2 would be better? Thanks! For heavy cleaning like that, I would recommend Optimum Power Clean. I have some fine scratches on my stainless steel exhaust. Should I use a heavy polish like M105 first and then finish it up with Optimum Metal Polish or will the Optimum Metal Polish be able to get out the scratches on the Stainless steel? I plan on using the Porter Cable 7424XP for the job. Try the Optimum Metal Polish first, and if it doesn’t get you the results you’re after, then step up to the M105. Nice job on cleaning the exhaust tips! You always amaze me. One question for ya. I have a full stainless steel exhaust system with a titanium tip. What would you recommend as far as products to use and the techniques? I’m just tired of seeing those little black specks from the rain and construction sites. Those are almost impossible to get off and I just been using soap, water, and a brush. Although I wouldn’t use 0000 steel wool on the Ti tips, you could use the same products and techniques as in this article. If you have tar or other stuck-on debris, you could use some Tarminator to safely remove it from the exhaust. What do you recommend for exhaust soot that’s been caked on for the last 5 yrs? I tried to get some of it off with the 0000 steel wool but nice dice. You just need to be careful as you get more aggressive. If you use too strong of a cleaner, you risk staining the outer portion of the exhaust tip. Having provided the “get more aggressive at your own risk disclaimer”, you could soak the inner portion with a stronger cleaner or ratio, and then scrub with some Scotchbrite. Awesome write up, Todd! I followed your instructions on a Acura TL that had tips that were black stained, I never knew they could be so shiny and metal colored! Amazed….I used grim reaper, 0000 wool, And CG Metal to polish. My only complaint is that I should’ve used a more course wool since the tips were caked with exhaust fumes. But I was lazy to go get one and ended up putting about 45 min on each tip! 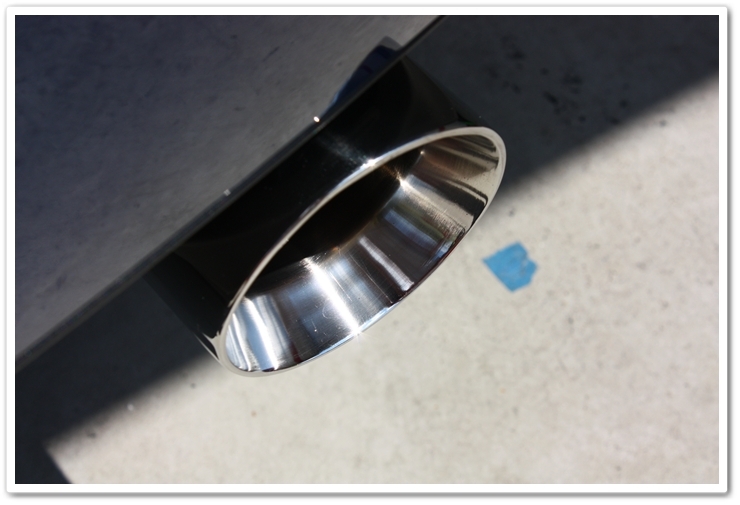 I am the Manager of a Car valeting center while in duty i receive many request to clean their exhaust pipe tips but as you know i can come across different types of pipes (stainless steel or metallic etc…)do you know any product to be sprayed on any one type and give good cleaning result.we are already using TFR( traffice film remover). Can the same techniques be used on pitted black chrome exhaust tips on my 2011 BMW 135i? If not, can you provide any tips or product suggestions? Thanks. Thanks Todd for the primer on exhaust tips. They now make nonsteel wool products of varying coarseness/ fineness (3M comes to mind). Using the non steel products will ensure no trace steel particle residue will be left behind to form rust, on exposure to moisture. Don’t ask how I know this. What would be appropriate to clean a black chrome exhaust tip on a 2013 BMW 328i? Perfect answer! That really gets to the heart of it! You nailed it! Not available to new customers who purchase a NOW TV Field Movies pack a partner pack which features a Sky Motion pictures Cross or with another offer.